When Economic Freedom of the World is released every September, it’s like an early Christmas present. This comprehensive yearly publication is a great summary of whether nations have policies that allow people economic liberty. I eagerly peruse this annual survey every year (here’s what I wrote in 2015 and 2014 if you’re curious about a couple of recent examples). And this year is no different. Let’s start with the table that gets the most attention. Here’s a look at the top nations, led (as is almost always the case) by Hong Kong and Singapore. Switzerland also deserves some recognition since it has always been in the top 5. The United States used to be a regular member of the top-5 club, but we have fallen to 16th in the rankings. Which is just barely ahead of the supposedly socialist countries of Finland and Denmark (which actually are very market-oriented nations in every area other than fiscal policy). I don’t show the nations in the bottom half of the rankings, but I assume nobody will be surprised to learn that Venezuela is in last place (though, to be fair, the communist hellholes of North Korea and Cuba aren’t in the rankings because of inadequate data). One of the other great features of Economic Freedom of the World is that you can look not just how nations rank today, but also how the have changed over time. I selected some nations of interest from Exhibit 1.4 in Chapter 1. Keep in mind, as you review this data, that you’re seeing scores every fifth year from 1970-2005 and then the annual scores beginning in 2005. A few observations on these numbers. Chile’s improvement has been dramatic, even though the nation has slipped a bit since 2007. 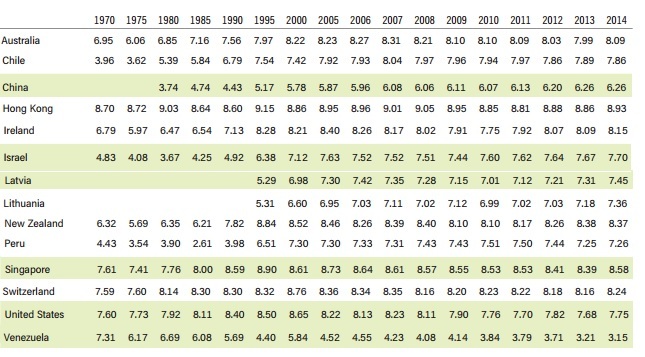 Australia’s jump from 1975-today also is remarkable, as is China’s improvement since it entered the rankings in 1980. Hong Kong has been consistently superb, though it’s troubling that its score has weakened slightly since 2008. Singapore also has a modest trend in the wrong direction. I didn’t know Israel was so bad back in 1980, or that New Zealand scored so low back in 1975, so kudos to both nations for big reforms in the right direction. I tend to give Estonia a lot of love, all of which is deserved, but it’s worth noting that its Baltic neighbors of Latvia and Lithuania also are big success stories. Speaking of overlooked success stories, Peru’s upward climb deserves a lot of praise. Switzerland isn’t overlooked (at least by me), but the praise it gets is very well deserved since it manages to be sensible while all its neighbors make mistakes. Last but not least, scores for the United States and Venezuela have both been falling, though thankfully we started much higher and have fallen at a much slower rate. Now let’s take a closer look at America. 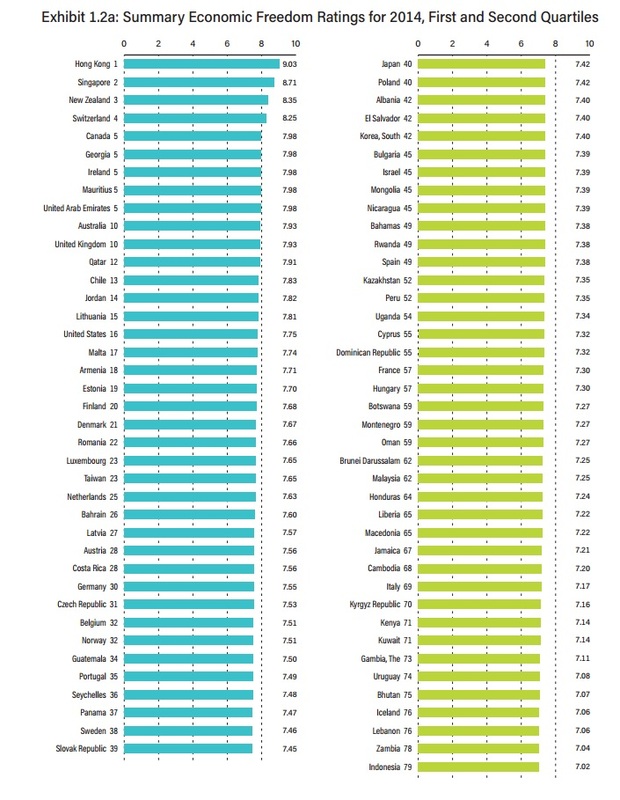 The good news is that we’re in the top 20 for economic freedom. The bad news is that we used to be in the top 5. I’ve been grousing for years that the Bush-Obama policies have eroded America’s competitiveness and undermined economic liberty. This year, EFW has a special chapter on the United States and it confirms my analysis. 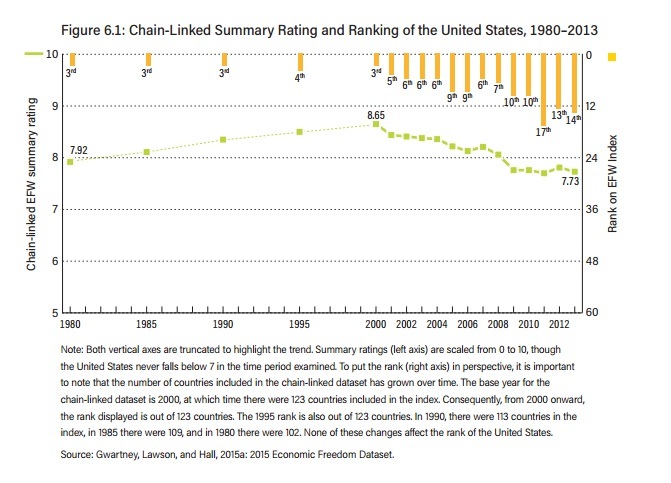 Here’s a chart from that chapter showing how America’s score has declined in recent years. 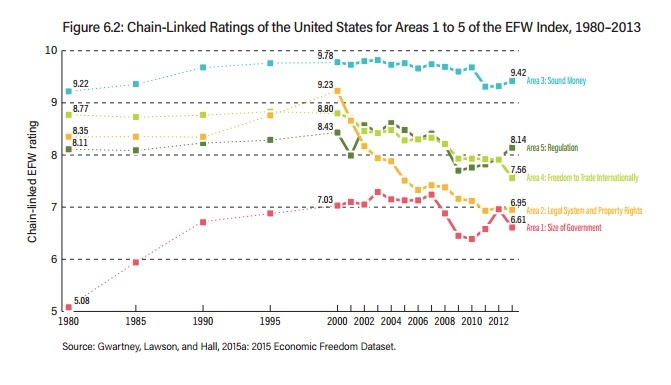 And if you want some additional details, America’s score is declining first and foremost because the rule of law is eroding and property rights are less secure. Which is a point I made last year, but EFW‘s chart is much better than my homemade version. You can also see that protectionism has increased since 2000. And one shudders to think what will happen in this area over the next few years given the protectionist utterances of Donald Trump and Hillary Clinton (though I hope Hillary is lying and trade is an issue where she’s actually on the right side). Heck, I’m worried about the next four years for reasons that go well beyond trade. I hope I’m wrong, but it seems that America faces a choice of a statist Tweedledee or a statist Tweedledum. It’s almost as if the two major-party candidates have read the recipe for growth and prosperity and have decided to use it as a road map of what not to do. Sigh. The numbers in the last column in the second table don’t match the numbers in table 1. Maybe there is a compilation error in the second table? No surprises but still a depressing post.